Time for Lewis Hamilton to win. It has taken 34 barren races, two years and the arrival of a 4-time world champion but finally Ferrari have returned atop the F1 podium. Amid the sweltering, humid heat in Sepang, Sebastian Vettel won the Malaysian Grand Prix, surprising and thrilling Ferrari fans across the world by finishing ahead of last season’s dominant Mercedes drivers Lewis Hamilton and Nico Rosberg. After the opening race of the 2015 season in Melbourne and a predictable one-two finish for Hamilton and Rosberg, fans and commentators alike were thinking that the 2015 season would mimic 2014, with the Mercedes drivers in another bitter two-man battle, far ahead of the rest of the pack. This pattern looked set to continue over the weekend in Malaysia. During a stormy qualifying session on Saturday, the tense rivalry between the Mercedes teammates dominated proceedings. Rosberg appeared to intentionally delay Hamilton in the final minutes of qualifying. However, the reigning world champion thrived in the difficult wet conditions to grab an impressive poll position. 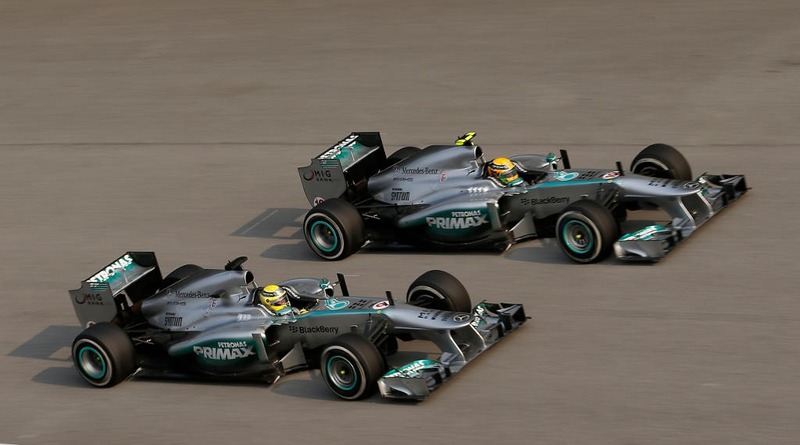 Lewis Hamilton and Nico Rosberg race at the 2014 Malaysian Grand Prix. At this point, Vettel was a subplot in the race between the two Mercedes rivals, even though the German had looked comfortable in his Ferrari car all weekend. The former Red Bull driver took his place on the front row and was only 0.074 seconds slower than Hamilton, placing him between the two championship frontrunners. The differing racing strategies of Mercedes and Ferrari was ultimately where the race was won and lost. During the early stages and under the conditions of the safety car, Hamilton was called in to make his first pit stop of three, as the degradation of the elected hard tyres slowed down the normally dominant pace of the Mercedes cars. In the meantime, Ferrari excellently carried out a two-stop strategy, where Vettel was comfortable racing with the faster, medium compound tyres. This made all the difference in the critical moments. Vettel was able to use his Ferrari’s new-found pace to pass both Rosberg and Hamilton during the race, proving the title credentials of the former world champion. After a disappointing 2014, and a barren spell of 34 races without a Ferrari victory, Vettel’s move to the Italian team from his dominant winning spell at Red Bull was questioned by some. Yet, his move now looks to be an inspired choice. This season’s Ferrari SF15-T has already made great improvements on last year’s model. The general consensus is that the balance of the car is much-improved and Vettel’s first win for Ferrari has sent a clear message to Mercedes that their car’s blistering speed can be matched. This shock result is great news for F1 fans, especially with Kimi Raikkonen’s comeback to a fourth place finish, after puncturing his tyre early on in the race. It is yet to be seen if the Ferrari team can push on from this emotional first victory of the season and make a credible title challenge. The team has an illustrious history at this race track; Sunday’s victory was the seventh win for Ferrari in Malaysia. The Sepang circuit is well-suited to the Ferrari’s fast pace, as it favours cars with a good straight-line speed. Other tracks will not suit the Ferrari team as well but if Vettel and Raikkonen can take crucial points from both Hamilton and Rosberg 2015 could be a memorable year for Formula One.